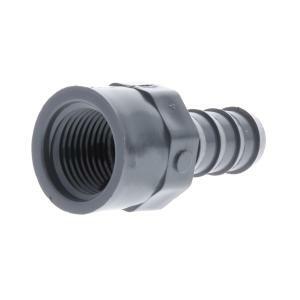 This durable PVC Barbed Insert x FPT adapter is commonly used to connect poly tubing to a threaded connection. Gray PVC insert fittings are made of the same substances as schedule 40 and schedule 80 PVC are made of. This means a durable long lasting fitting. Insert fittings are normally used with flexible pipe, hose or tubing. Simply slip the barbed insert tip all the way into the flexible pipe, hose or tubing. Multiple sharp barbs provide a tight grip on the flexible materials to create the seal. Some uses, such as higher pressure applications, may require clamping to provide a tighter leak-proof seal. Proper clamping technique is to place the clamp directly over the barb area and tighten.